I absolutely love baking cookies. It started when I was a kid baking cookies with my mom. She would bake cookies for almost all of my school events, although she was most famous for her donations to my high school tennis team. Before each match she would make a batch of chocolate chip cookies and place them in a metal coffee can that had been wrapped in decorative contact paper. My arrival to tennis matches was always eagerly anticipated by the team because they knew they were only moments away from devouring some “mama o’doyle” cookies. I enjoyed the feeling of being able to share that with my friends so it was a tradition that I’ve continued. To my closest friends, I have provided them with their own decorated coffee can and told them that whenever they return it to me, I will fill it with cookies and give it back. It makes me a little sad, but nobody that I’ve given a can to have returned it lately. I’m sure the cans have been either lost or damaged but it still hurts a little bit when I think about it. Still, I’ve taken cookies to work, my kids events, distributed them during the holidays, etc. One thing has always bothered me, though. I constantly get asked the question “did you really make these or did you buy them?” I find it rather rude that people would question my gift to them. I do understand why they ask. Each cookie is the exact same size…the result of using a cookie scoop. Turns out, most people have never heard of a cookie scoop. So then I’m forced to recite the recipe to them. What’s weird is that even though I know the recipe by heart (and have for years) I still pull out the recipe card when I’m baking them. There’s no real reason for it, I don’t usually even glance at it. I guess it’s just comforting to have the recipe sitting there. My mom once said that the recipe is nothing special, it originally came from the back of a package of Nestle chocolate chips (which I find funny because I only use Hershey chocolate chips – brand loyalty). It is an award-winning recipe, though. I entered it once in a baking competition at the County Fair. I won a red ribbon for them. Of course, my mom used them (since they’re exactly the same as when she makes them) at the same competition and she came home with a blue ribbon. How can the same cookie get two different awards? Since then, I’ve always been a bit suspect of events that are judged. I’ll let you judge for yourself if you enjoy these cookies. Preheat oven to 375 degrees and bake for 8 minutes. 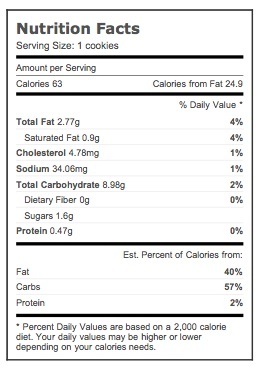 Using the Livestrong.com website, we entered the details of the recipe and it calculated this nutritional information (for those that are curious).